British Women Writers Conference 2019, “Movement,” April 25-27, Auburn University, Auburn, Alabama. Keynote Speakers: Dr Elizabeth Bols (University of Oregon), Dr Elizabeth Home Chang (University of Missouri) and Dr Lesa Scholl (Kathleen Lumley College). “Queen Victoria’s Contemporaries: Born in 1819,” Friday 17th May 2019, 12:00-17:00, Glasgow Museums Resource Centre. Keynote Speakers: Dr Trev Broughton (University of York) on contemporaneity among Victoria’s Victorians, and Dr Gregory Tate (St Andrews) on Arthur Hugh Clough. 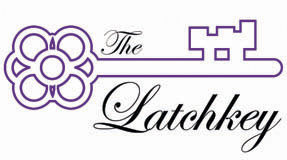 Victorian Popular Fiction Association’s 11th Annual Conference, “Mind, Matter(s), Spirit: Forms of Knowledge in Victorian Popular Fiction and Culture,” 8-10 July 2019, University of Greenwich, London. Keynote Speakers: Dr Chris Louttit (Radboud University), Dr Beth Palmer (University of Surrey), Dr Christopher Pittard (University of Portsmouth). British Association of Victorian Studies (BAVS), “Victorian Renewals,” 28-30 August, University of Dundee. Keynote speakers: Prof Jo McDonagh (University of Chicago), Prof Heather Shore (Leeds Beckett), Prof Lorraine Janzen Kooistra (Ryerson University). 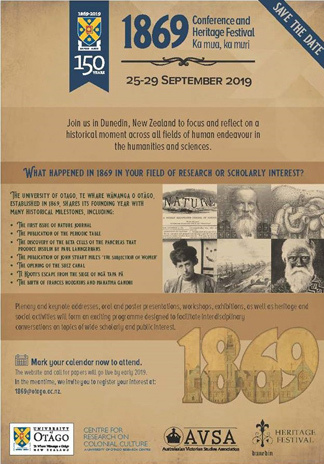 Australasian Victorian Studies Association (AVSA), “1869 Conference and Heritage Festival,” University of Otago, New Zealand, 25-29 September, in collaboration with the Centre for Research on Colonial Culture. Keynote Speaker: Professor Marion Thain whose work also includes “Michael Field” and other late-Victorian writers. The International Centre for Victorian Women Writers (ICVWW) continues to be a Website of [Considerable] Interest. With its mission to launch and to support research in New Woman literature, crime and sensation fiction, and textual editing (to name a few), the Centre fosters an intellectually stimulating and supportive community. For instance, the site’s “Not Your Average Josephine” project provides a regularly updated database of Victorian women writers, all of whom have been discussed at ICVWW conferences. The project encourages we question and examine constructions of the Victorian woman writer, whether famous or less well known, and also encourages readers’ participation. Those wishing to add to an existing entry or to add another woman writer to the database’s alphabetical list, can email with the suggestion and information. Click on the link below to go to the ICVWW’s main page and navigate from there.